On a warm Friday afternoon, a large crowd of parents and students gathered in the OLF courtyard for a pet blessing conducted by Father Daniel. This year Father Daniel blessed a wide variety of animals including dogs, cats, fish, gerbils, a parakeet, and even a duck. “I think it was a wonderful opportunity to bless the animals because that is part of God’s creation,” said Father Daniel. Joyce Philippe, a reporter for WLOX-TV, covered the event. Her story may be seen here. 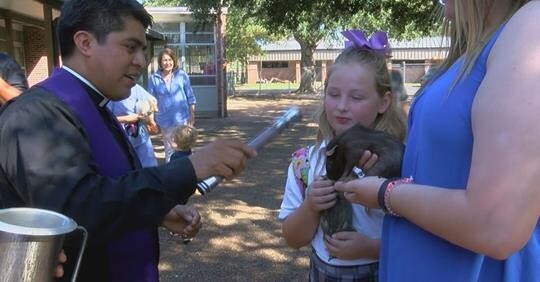 This event is held annually at OLF Elementary in remembrance of St. Francis of Assisi’s love for all creatures. His feast day is October 4th.